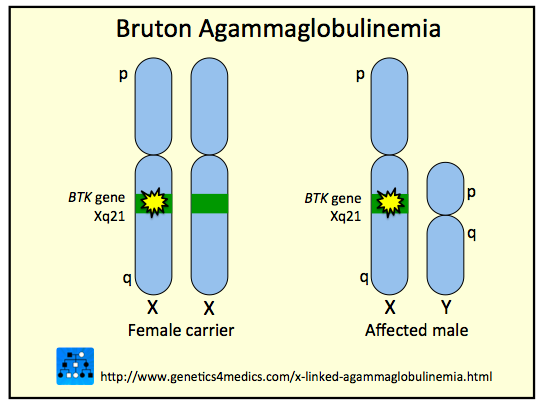 The X-linked agammaglobulinemia is characterized by low or absent immunoglobulin levels and lack of B cells, leading to recurrent infections with encapsulated bacteria. 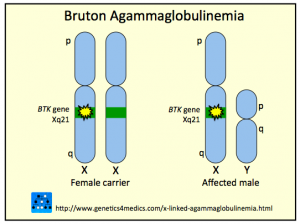 Agammaglobulinemia is a primary immunodeficiency disease belong to the humoral immunity deficiencies. 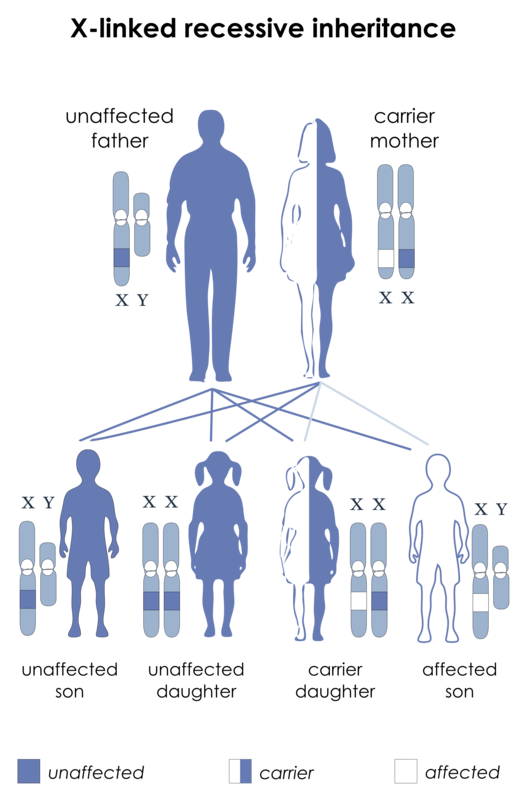 It results from mutations of a gene on the X chromosome that encodes the Bruton tyrosine kinase (BTK). BTK is essential for the development and maturation of B cells; without this enzyme maturation of B-cell stage aborts, consequently leading to a lack of mature B cells and the lack of antibodies. Hence, male infants have very small tonsils and lymph nodes do not develop; there are recurrent pyogenic infections of the lungs, sinuses, and skin with encapsulated agents (e.g. as Streptococcus pneumonia, Haemophilus influenzae). Cildren with XLA are usually typically for the first 1 or 2 months of life because they are protected by antibodies acquired before birth from their mother. After this time, the maternal antibodies are cleared from the body, and the affected child begins to develop recurrent infections. In children with XLA, infections generally take longer to get better and then they come back again, even with antibiotic medications. The most common bacterial infections that occur in people with XLA are lung infections (pneumonia and bronchitis), ear infections (otitis), pink eye (conjunctivitis), and sinus infections (sinusitis). Infections that cause chronic diarrhea are also prevalent. Recurrent infections can lead to organ damage. People with XLA can develop severe, life-threatening bacterial infections; however, affected individuals are not particularly vulnerable to infections caused by viruses. With treatment to replace antibodies, infections can usually be prevented, improving the quality of life for people with XLA. Patients are vulnerable, which can manifest itself as progressive dermatomyositis with or without encephalitis against persistent CNS infection by live vaccines of polio (n. D. Talk . : no longer permitted in Germany), Echo and Coxsackie viruses. The diagnosis of X-linked inherited agammaglobulinemia is (via the detection of lower (at least 2 standard deviations below the mean) immunoglobulin levels (IgG, IgA, IgM) and the absence of B-cells <1% of lymphocytes are CD19 + cells, which detected by flow cytometry will be provided). Transient neutropenia may also be present. Genetic tests can be used to confirm a diagnosis, but are not required. They are usually recommended for the 1st degree. If the mutation was identified in family members, mutation analysis of chorionic villi, amniocentesis or a blood sample of the umbilical cord might allow the diagnosis during pregnancy. Treatment consists of immunoglobulin replacement therapy. is very important in any infection the immediate and adequate administration of antibiotics; the treatment of bronchiectasis may require a frequent change of antibiotics. Live virus vaccines are contraindicated.